With the bikers done, I’m kind of at a pause with my Khorne Daemonkin army. I mean, I could work on a Chaos Rhino that would have colors uniform to the army (I usually just toss in my Black Legion-schemed Rhino when I need it). But I think it’s better just to take a break from them for now. No need to rush into burnout, right? Instead, I’m going to work on some models that have been sitting patiently on the shelf for a while now. Given the rumors of what is coming out in the next few weeks, I’ve decided to work on a squad intended to beef up my Black Legion force. Five of these models have been pledged (twice!) before in The Bolter and Chainsword‘s annual Call of Chaos painting event. The Chaos Space Marine with the Flamer predates even that. In fact, his flamer is from the old metal Raptor kit, and I put him together back when metal Raptors were still stocked by Games Workshop. So, yeah. These models have been around and waiting to be finished for a long time. Veterans of the Long War, indeed! And at long last, it’s time to get them done and ready for the tabletop. As you can probably see, I’ve already begun to work on the trim that’s in Chainmail. My paint scheme for my Black Legion forces is pretty simple. 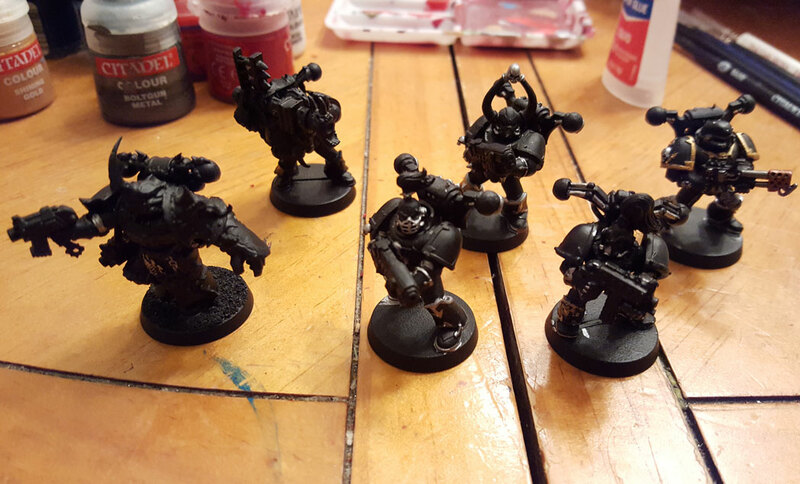 I use Chaos Black for the base, Chainmail and for the various tubes/pipes, joints, and vents, as well as some of the lower trim. I use Shining Gold shoulder armor and most upper trim. Boltgun Metal is used for most of the weapons, though I usually leave the casings black. Most of the highlights will be done in Codex Grey and Mithril Silver. And I will probably do a wash of thinned Flesh Wash over the gold, which gives it a slightly reddish luster. It’s not a particularly technical color scheme, but then, Black Legion was my first army and I’m trying to keep the scheme somewhat in line with the older models in my collection. That way there isn’t a huge aesthetic break when you see them on the tabletop. A bit OCD? Perhaps, but I’m sure there are folks out there who can sympathize. I hope to be done with these guys within a couple weeks, or by the beginning of May at the latest. That way I’ll be able to work on a couple or three new Khorne Daemonkin models for The Bolter and Chainsword‘s E Tenebrae Lux V.